A superior performance requires experience. Change equals motion, which equals the future. This is a phrase that describes the dynamic process we´ve taken since our foundation in 1924, during the course of which we have developed into an internationally renowned specialist in tooth shades. We were the first dental company to describe natural tooth shades in scientific fashion and to document them in the form of shade guides that have become the international standard. Our goal is precise shade reproduction. This also includes establishing reliable processes in laboratories and dental practices, improving the workflow, saving time and money, and ultimately, producing esthetic results. VITA classical A1–D4® and VITA SYSTEM 3D-MASTER® Always the right choice. Already on the market since 1956, the 16 shades of the VITA classical A1–D4® shade guide provide a standard basis internationally, acting as a reference system in tooth shade determination. Its effective reproduction of 26 natural tooth shades was raised to a whole new level with VITA SYSTEM 3D-MASTER®. 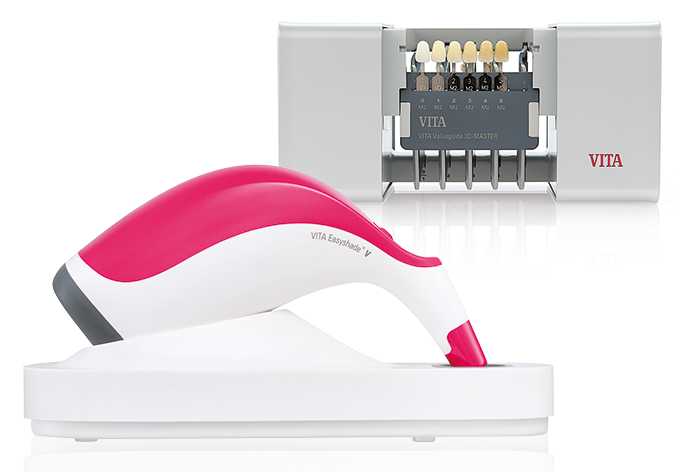 Based on systematic research of the distribution of natural tooth shades within the color space, the development of VITA SYSTEM 3D-MASTER® provides a solution that facilitates the exact description, communication and reproduction of each patient's tooth shade.